The American Motorcycle Classics (AMC) Harley-Davidson dealer in Albany, OR., is going out of business at the end of the month. They’ve called it quits. Years ago the business was run by John Lewis, Sr. 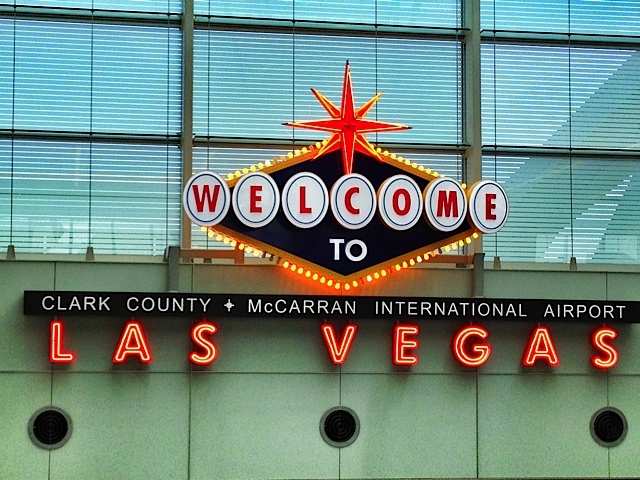 He retired, moved to Las Vegas and sold the business to his son, John, Jr. The G.M. was Joe Saltarello. Was it the poor economy? Sure didn’t help. Were other H-D dealers complaining how Albany was cannibalizing their business which is only good for the consumer? Did they invest in the business? Depends on your definition of “invest.” Maybe John, Jr. was having problems making the payments to Sr., who may have held on to the real estate and now decided to liquidate the assets, cut his losses, sell the real estate and call it a day? Or, maybe they were FORCED out by the H-D motor company? Hey, now that is an interesting question. Maybe it’s a combination of all of the above. Who knows? If you do know send me a note. I’m discreet. Here is what we do know. Over the last two years H-D is trying to consolidate its dealerships one way or another. H-D may have just sent a letter of retirement to Albany/John Jr. In essence it withdraws approval for the H-D franchise. 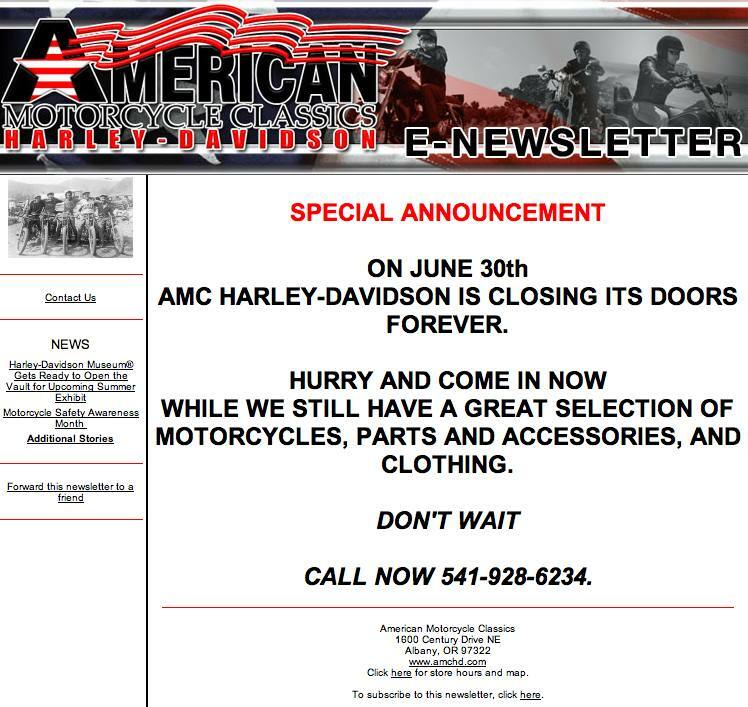 I called and spoke to the finance manager at AMC earlier in the month and he indicated that H-D was “forcing them out.” Similar to the Chevrolet and Chrysler dealership forced closings. Maybe it was sour grapes, but his statement went something like “HD was demanding they expand the store” and while they had committed a half-million $$ in infrastructure investment to H-D in what could be viewed as mini “Super Store” … they just didn’t have the sales revenue for such an investment, essentially being forced out by the manufacturer. It’s not clear if AMC was selling a reasonable volume of licensed products, but I think it’s unlikely given the location. The finance manager also stated they were doing about half the motorcycle sales volume they once garnered 4 years ago so clearly the economy has had a relevant impact. Businesses fail all the time so what’s the point of this post? Well, AMC H-D is well known in the northwest for being the cheapest H-D dealer in Oregon. If I had interest in a new motorcycle I would always call or drive down and get pricing whether it be a motorcycle or parts. That then became my new starting price to leverage any deal at a local dealer closer to the Portland metro area. I never did purchase a motorcycle there, but I have 4 buddies who all purchased motorcycles during the last 2-4 years from Albany. They obtained below MSRP on every purchase, including additional discounts on aftermarket parts and walked away saving $1000’s and big smiles! And even though they saved all those $$’s… cheapest does not always work. You can’t always make it up on volume and it now seems that little was dropping to the bottom line to keep the doors open and make the payments. We’ve seen this behavior in other type businesses. A person will throw an “open sign” up in a strip mall and offer cheap prices — way below the current market — but in less than 24 months they disappear. It means they were not making enough money, and just screwed up the market for everyone else. AMC H-D had a “No pancakes, No S*****t, no rock band, no bull” slogan which was essentially an anti-social slam toward other dealers who subscribe the post-sales mantra. But you know what? That doesn’t work for some folks. Yeah saving a few bucks is important (always! 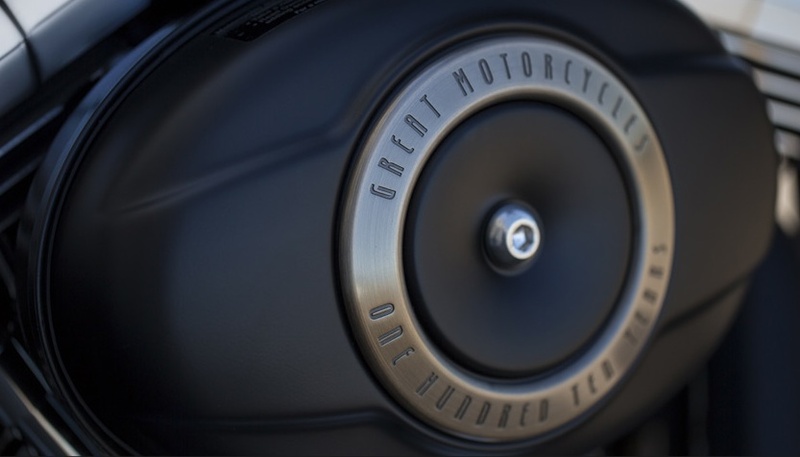 ), but many of us are motorcycle enthusiasts and are looking for a dealer that will be in business (long-term), one that’s like a social “club” to hang out, talk shop, talk custom modifications and they are willing pay a little extra $$ to have that option. Personally I like the fact that Paradise personnel (Mike(2)) know who I am and will call me by name when I walk into the dealer. We’re not BFF’s, but I know, that they know, that I over paid a few hundred $$ for that privilege on my last motorcycle purchase, and for me it’s more than just a money transaction – its genuine relationship building – AFTER the sale. Maybe this is what happened at Albany? They had “A Beautiful Mind” moment. Did you see the movie? In the movie Russell Crowe plays John Nash, a mathematician who won the Nobel Prize for developing the concept of non-cooperative game theory. In case you’re not familiar with the theory, it roughly means that to make the best decisions, you have to consider the actions of your competitors. There are consequences other than it’s “Christmas in July” for Paradise H-D, Salem H-D and Team Latus! There is the loss of 10-19 people who are no longer gainfully employed – and I’m not trivializing this because the folks there are hard working people and deserve better – but, PowerSports Network (powered the website) loses a customer and AMC H-D also sponsored the Pioneer H.O.G .Chapter (newsletter PDF HERE). It was the first northwest chartered H.O.G. 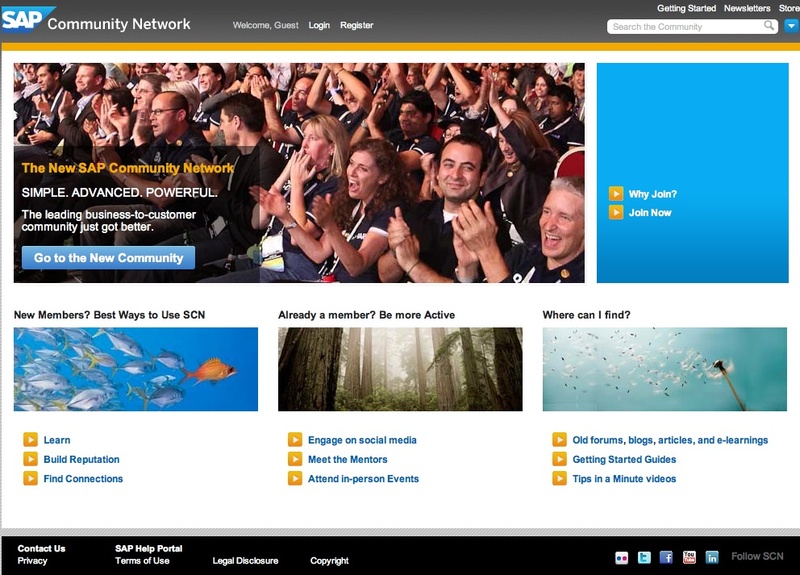 chapter (#4085), and it now has no home. I’m sorry to see the dealership close and I’m sure for many of you it feels like losing an old friend. I’m just glad I don’t have any pre-paid expensive special parts on order! Photo courtesy of American Motorcycle Classics. About 40 years ago, a social movement arose to destroy the establishment. People wanted to take on the man and return power to the people, upend the elites and lead a revolution. Some would argue that today we have a similar movement with the people loosely called the “tea partiers” who today are motivated by runaway federal spending vs. the war during the Woodstock days. So it is according to AMC H-D in Albany, OR. Based on their most recent communiqué, the Milwaukee Motor Company decided that starting in March there would be a policy change which prevents dealers from advertising any sales storewide. 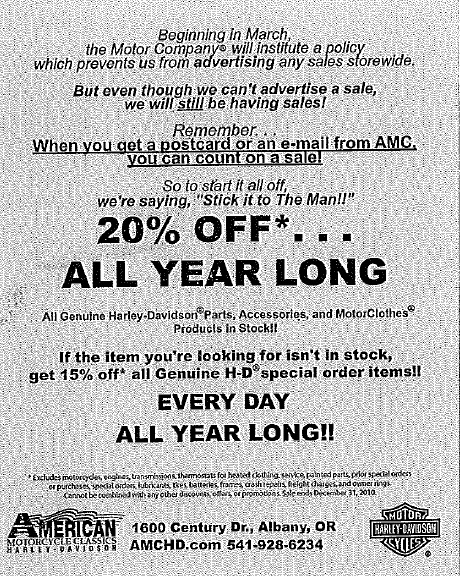 So, taking a page from H-D’s own corporate marketing campaigns and doing their own mini-version of “Stick it to the Man” type of advertising…AMC H-D created their own tea party movement and broadcast there plans to have a 20% off sale (excluding motorcycles) all year long! If the item you need isn’t in stock then you’ll get a 15% reduction when you place the order. Talk about counter-establishment. Pure advertising genius! So what’s in play here. 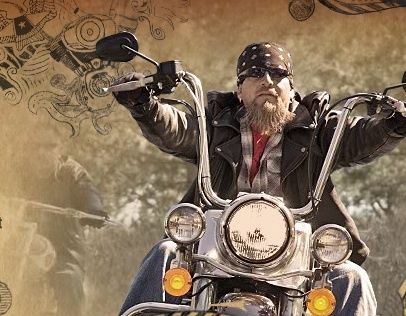 First and foremost is a job-less recovery is making it darn hard for any motorcycle dealer. 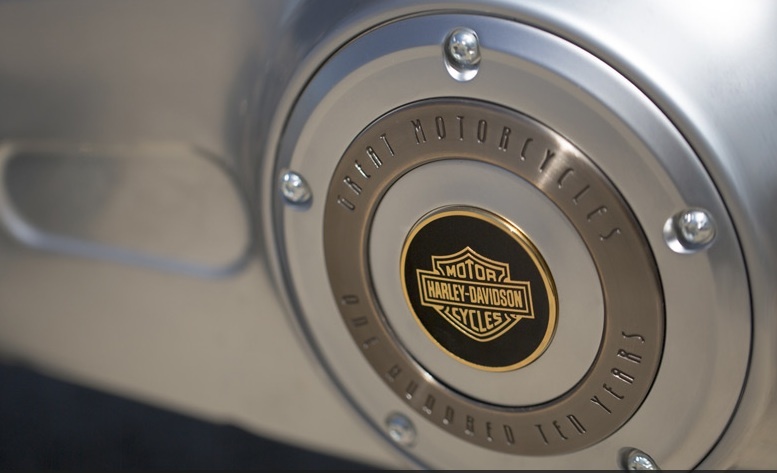 Second, H-D would like to continue to be viewed as the premium brand or “exclusive” product and thus does not want to be attached to a “sale” image with their brand. 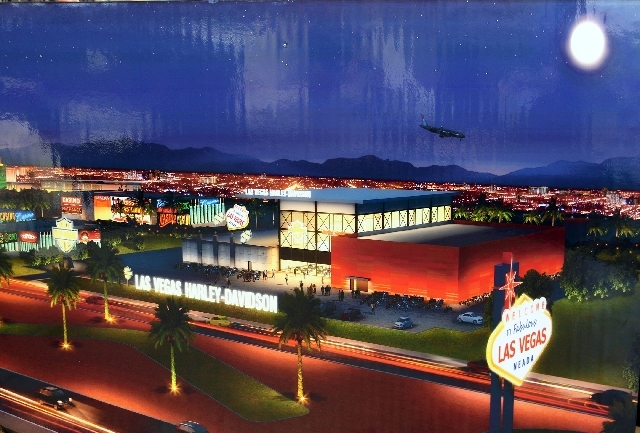 Lastly, the dealers who prefer to operate in the higher margin “dealer markup” mode are likely pressuring H-D to stop the undercutting from lower margin dealers who have yet to succumb to the mega/bistro/resort level expense in renovating a dealership. Remember Timpanogo? We all know that if you want service after the sale, knowledgeable and friendly staff, a quality product, and pancakes on Sundays, you’re gonna pay for it! The question is just how much more. Photo courtesy of AMC H-D.
It’s roots have an Arabic theme and come from founders Billy Florence (an actor) and Walter Fleming (a physician). This symbol is part of a fraternity and wearing the red with black tassel is one of the most distinctive. It derives its name from first being manufactured in the city of Fez, Morocco. I’m talking about the Shriners Fez! The Shriners usually gather monthly with some type of activity, but more importantly, the various local clubs serve as an extension of the entire Shrine in their respective communities. They reach out to the civic groups, chamber of commerce, local schools and other services to share messages and their mission. The Shrine Clubs serve a vital role in community Child Care programs, whereby they raise monies for the Shriners Hospitals for Children, through many donation efforts and Hospital Fund Drives. And now you can wear your “Robur et Furor” (Strength and Fury) emblem while riding on a Harley-Davidson limited-production 2010 FLHTCUTG Tri-Glide Ultra Classic motorcycle – the Shrine Tri Glide. The “Shrine Glide” is offered for members in Arctic White with Red & Gold pinstripes or for Jester members in Concord Purple with Violet & Burgundy pinstripes. The ordering window is open now until Friday, March 5, 2010 through any H-D dealer. Since this is a limited quantity, the order window could be closed sooner if the production is sold out. 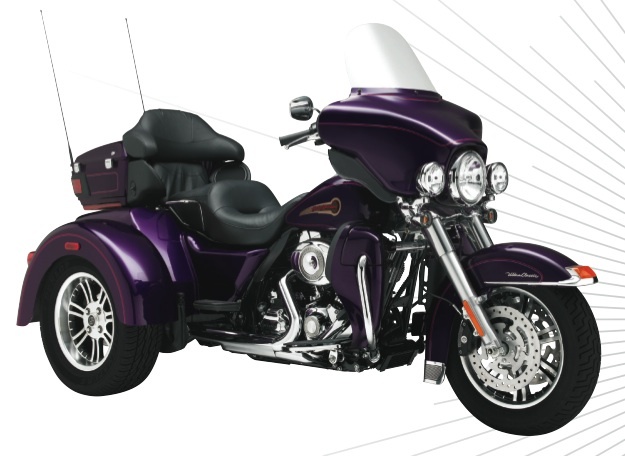 Imagine the looks you’ll garner from children at the hospital riding in on that Concord Purple model! It’s economics. You can’t recycle when it costs more to use the existing product than to use the raw material. You can try, but the economics will likely run you out of business. Like magic it will take you to a web site strongly associated with that word and amazing things might inspire. I know it sounds like I’m taking a cheap shot at the savvy marketing dudes and I can certainly understand a business’s desire to avoid additional expenditures in these trying times. But, is this truly THE best sales promotion idea out there? Another ad-hoc suggestion is to ping the Facebook group or independent bloggers and have them share ideas or comments on the best way to spark people’s interest. Sure it’s subjective opinion, but who knows what ideas it may inspire. Let me know how it works. Photo courtesy of Flickr. Motorcycles recycled into chairs/table in Sass Fee Switzerland.